In 2019, the acoustic guitar market is more diverse than it's ever been, so defining the qualities of 'the best acoustic guitar' is a tough - but pleasant - challenge. There are not just more acoustic guitar brands, manufacturers, countries of origin, purposes and model iterations than ever before. Across the last decade we've also seen a quantum leap in the quality of the instruments being produced at lower price points. In short, the acoustic guitar market has never been more competitive, which is fantastic news for us buyers. The selection you'll see below represents a broad cross-section of the industry, offering a collection of acoustic guitars that range from flawlessly-executed high-end investment pieces to modern classics and affordable off-the-shelf mass production models that punch way about their weight. In addition, there's a diverse array of body sizes and shapes to suit all purposes, including the ever-enduring dreadnoughts, parlour guitars, blues boxes, a nylon-string instrument and even a silent practice guitar that seriously impresses when plugged in. 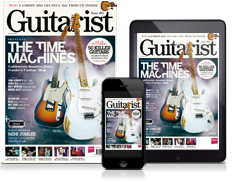 All of these models have been tested extensively by our reviews team and this round-up collects together our highest-scoring instruments across multiple categories of acoustic guitar, including electro-acoustics and acoustic guitars with pickups. Many consider the D-28 to be ultimate expression of the dreadnought form. ‘Reimagining’ such a guitar could be a poisoned chalice. Fortunately, you can still feel the gravity of that 184 years of history in its high-end guitars. The latest D-28 features forward-shifted bracing, a wider nut and vintage-style aesthetic changes, but it’s the new neck design that really makes this the most comfortable and accessible dreadnought playing experience we can remember for some time. The sound is balanced and maintains the very definition of an ‘all-rounder’. Notes ring out with sustain - that clear piano-like definition we love from Nazareth’s craftsmen. Harmonics come easy and, with strumming, the high mids and treble have choral qualities that don’t overshadow the lower mids. Despite the tweaks, our test model still largely feels like the acoustic equivalent of Leo Fender’s Stratocaster design. Just as that outline is most synonymous with ‘electric guitar’, so to the D-28 continues to embody the dreadnought in look and sound. The Builder’s Edition V-Class K14ce - one of four new 2018 V-Class launches that also include a K24ce, 914ce and PS14c - is a bold statement of intent by Taylor, combining the new V bracing with a notably different, more comfortable, Grand Auditorium style. Of course, its build quality is nothing short of exceptional as we’d expect - not least at this price. We’re also reminded of the K14ce’s high-end lineage, however, by the paua ‘spring vine’ inlay that lies down the majority of the black/dark brown ebony ’board, while a lighter koa purfling stripe sits just inside the ebony edge-binding and continues around the headstock, which is again ebony-faced with a relatively demure paua inlay. The aged-gold Gotoh tuners perfectly fit the slightly worn-in vibe - hugely understated class, just like the green abalone dots in the ebony bridge-pins. While there’s plenty for those who love details to admire, the modern Taylor guitar is hugely sorted in terms of playing feel. V-Class, Builder’s Edition? Get used to those terms. Taylor has upped the ante. Considerably. Unplugged experience is wonderfully reflected plugged in. We’d like to see a non-cutaway option, please, Yamaha - not all stage players need a cutaway. There is traditionally a gap between how we enjoy the sound of our guitars and the way they’re represented plugged in. Enter Yamaha, a leader in stage-ready acoustic technology for decades - and in the A5R ARE, it may have just offered us a very desirable solution. The A5R''s rounded fretboard edges offer an enjoyable playing experience that mimics the feeling of guitars that have been played in to a degree and it has an ethereal quality in the high ranges, even though some treble resonance is traded with the lower action. The A5’s resonance and bright balance is a fine showcase for the clever SRT2 preamp - we actually couldn’t dial in a ‘bad’ sound on it because the treble and bass controls mirror the natural subtlety of the pickup/mic dynamic design. An electro experience that captures the sound of an unplugged acoustic? The SRT2 is one of the closest to get there yet. An update that marks the A Series out as an essential consideration for players who rely on a consistent and controllable stage sound. Superb strumming and flat picking tones. The D-55 is Guild's dreadnought, very similar in shape to the all-conquering 14-fret Martin on which it's based. However, if your used to a handful in the neck, the D-55 dreadnought makes for quite the contrast: a gloss neck, and slimmer nut accentuating the neck's overall thinness; more a D than a C profile, to invite comfortable first-position chords, aided by an impressively low action. That Adirondack bracing is doing its job, too, because string separation, definition and dynamic range are all notable and it feels loud, alive and resonant when playing soft or hard. If this guitar is anything to go by, the latest Traditional models are absolutely up there with the other big American names, offering superb quality craftsmanship and world-class tone. The D-55 is a potentially serious workhorse that has every likelihood of outlasting and outperforming any one of us as long as we can keep on picking - a sumptuous strummer. The entry model of the Classic Design Series is a good reminder of just how much guitar you can get for your money at the more affordable end of the market. We've come far since the days of high-action, poor tuning stability and shoddy construction that used to mark out lower-priced models. Instead, we're offered a solid-wood mahogany top, laminated mahogany back/sides and an inviting rolled fretboard edge. The CD-60S' intonation is great out of the box, too, though not too low to make us wary of alternate tunings. The mid-character of mahogany is certainly here, bringing some meat to a brightness usually associated with spruce tops (remember what we said about no hard and fast rules with tonewoods?). The result is something that’s genuinely inspiring to play and chimes in chord work. Why should new players settle for just okay when they need to be comfortable and inspired? And there’s no reason why this dreadnought wouldn’t be a good addition for anyone else, too. Structurally and sonically it is close to being a faultless guitar. The colour might not be to everyone’s taste, but it grows on you. From top to bottom, this Hummingbird creates a buzz. Whatever your preference in size, colour, tone and playing style, it’s difficult to avoid picking this Cherry Sunburst up. It’s such a simple guitar to play that it’s rare to ever feel like you’re incapable of striking the right chord - especially on a neck that’s just 12” in radius. While the traditionally ornate decoration and blushing finish have been lovingly retained, this modern Montana incarnation offers a discrete LR Baggs Element VTC system for plug-in power. It is unlike many we have seen and produces one of the best sounds we’ve heard from an electric acoustic. 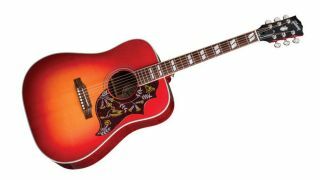 Throw in the pleasure of playing such a superb guitar and it’s tough to say anything bad about the Gibson Montana Hummingbird Cherry Sunburst. We like the minimal looks. This D-15M dreadnought features a solid 'genuine' (South American) mahogany top over A-Frame X bracing; the same material is used for the back, sides and neck. The neck profile is a 'modified low oval', and it's hard to imagine anyone having a problem with it. Bone nut and saddle: check. Vintage-style, open-gear tuners: check. Super-thin matt nitrocellulose finish all over: check. Tonally, there is a rich and projecting core sound that's complemented by the unmistakable, Martin D-resonance. It's vibrant and ebullient, yet not brash; warm and full without being thick or indistinct. It puts every single cent of its build budget into making the best sounding and playing instrument, with very little concession to cosmetics, electronics or anything else. Solid woods, improved neck joint, bone nut and saddle, no frills whatsoever, save for the 'burst top: it's unreservedly recommended. Nothing, really, though cedar-topped and nylon-stringed versions would be nice. The Mexican-made Mini is equally functional as both a travel-sized acoustic and "modern day parlour guitar". Despite its small footprint, the GS Mini is no toy instrument: there's a solid Sitka spruce top, a faultless build quality and the setup is immaculate. Rather like a good parlour-size guitar, the GS Mini outputs a sound that belies its compactness. We'd lay a considerable sum to suggest it'd be a fine recording guitar, that tight low end giving space to a bass guitar (or bassier six-string) while the mids aren't overly honky, as some parlours can be, and the silky, sparkly highs are pure Taylor fidelity. Far from a gimmick, this is a guitar with its own vibe and voice - and both are very appealing. A sweet blues and country box designed for the nomadic musician. If you have massive hands your thumbs might get in the way. Made by Art & Lutherie, a sub-brand of Godin Guitars (known mostly for its electric guitars) this parlour model cuts straight to the chase - it’s clean, it’s earthy, it’s got attack and its design takes you back in time to the rural deep south where all you might have needed were the clothes on your back and this instrument for company. Playing this Roadhouse Tennessee Red is an absolute joy. The middle and upper ranges of the guitar are very strong. When we try some alternative tuning, dropping the bottom E to a D opens up the bass no end. Blues and country come to the fore. There’s clarity too, combined with an understated subtle warmth. A pocket-sized bag of country rock ‘n’ roll - compact and ready to go at a moment’s notice. Almost unrivalled tones (for a new guitar). There's no doubt about it, the CJ35 is utterly breathtaking. Every angle, every edge chamfer and detail is executed with the kind of meticulous precision rarely seen in guitar- making at any level. The specs might look simple on paper, but the tiny details delight, for example the perfect walnut strip down the centre of the mahogany back, the unfussy yet charming body binding and rosette and the cut-through bone saddle that extends into the shoulders of the unfussy rosewood bridge. It weighs next to nothing, and you can feel the thing vibrating the second you take it from the case. The quality of build, not to mention the precision and depth of the CJ35's tone are second to none. A scarily good, once-in-a-lifetime guitar for a very lucky few. Only the wholly derivative design. In a timeless classic Dreadnought design it appears to offer something to satisfy the needs of many a blues, folk or bluegrass picker or strummer. Open chords and 1st-position licks fall deftly under the fingers, while moving up the neck for barre chords and other musings requires no huge effort. The compensated bone saddle means intonation is as good as it gets on an acoustic. Whether it's used as a basher of chords, for the odd solo or with a capo for fingerpicked accompaniments, the SDM-15 passes muster on all counts. While it doesn't exactly brim with sophistication, it's a wholesome voice that matches the guitar's appearance - earthy, rich and dark. Should you be looking for a bluesy belter or general all-round acoustic, then the SDM-15 is the no-brainer of all no-brainers. A modern hybrid that has nylon strings, but feels and looks more like a steel-string, the NTX has a narrower neck than a classical, a radius'd 'board and 14 frets to the body. There's no soundhole rosette, just some arty marquetry-style decoration, and that soundhole is oval. Construction is crisp and faultless. The neck is wider than your average steel-string, of course, but it's very easy to get used to, plus, unlike a classical guitar, we get side dot-position markers and two strap buttons. From its balanced acoustic sound - quite subdued in terms of volume - to its amplified tone, Yamaha really has got this right. Plugged-in, there's a natural sound with no piezo quack, which records well into your DAW; it loves modern effects, too, and hey, you wanna play it with a pick like Rodrigo (who uses a custom-made version of this very guitar), be our guest. Smaller body makes for a more comfortable playing experience. Excellent build quality and materials. Lacks the depth of a full-sized dreadnought. Unlike Martin's own X Series, or indeed, the minimalist cool of Taylor's Big Baby, the Dread Junior might be downsized, but it's very grown-up in build, with all-solid wood construction, proper mortise and tenon neck joint, a bound top edge and simple soundhole rings. It might not have the huge depth or width, harmonically speaking, of the full-size dreadnought, but there's a punchy midrange and a slightly textured edge. It retains a Martin stamp: classic, old-school and a fine picker's choice, too. Put simply, it's a cracking guitar, far from a Guitar Shaped Object. For serious younger players, it's a great entry into Martin's heritage, but the more compact size means that many a more mature player will enjoy it, too. Sounds superb through a PA. Beyond the divisive looks - very little. An electro-acoustic guitar that barely has any acoustic volume, but put a set of headphones on and you'll hear your playing with a studio-quality acoustic sound and posh effects. Oh, and you can plug in your mp3 player, too. What's more, plug this so-called Silent Guitar into a PA or acoustic amp and you have a highly realistic electro-acoustic sound without any feedback. The solid mahogany centre-block and maple laminate frame might raise some eyebrows, but the neck is quite normal: a mainstream-feeling handful that typically is beautiful fretting and plays really well - like any other Yamaha acoustic, really. Live, expect to see jaws drop, because your audience won't believe what they're hearing from such an infeasible-looking instrument.